Hydrologic investigations of surface waters are dependent upon data gathered at streamflow and water quality discharge monitoring stations operated throughout the state by the U.S. Geological Survey and the OWRB. Data obtained from the statewide streamflow monitoring network can be used for many purposes, including flood prediction, drought monitoring, development of reservoir operation plans, and other related planning activities. Due to limitations on the number of streamflow monitoring sites available in Oklahoma, streamflow modeling is becoming an increasingly important tool to estimate streamflow values between monitoring stations and in watersheds deficient of monitoring sites. Characterization of the watershed is necessary to determine factors affecting streamflow. Variation of slope over a watershed, land use, precipitation, stream size and gradient, amount of base flow from groundwater, water use, and other hydrologic characteristics significantly influence the amount of flow in a stream or river. The interaction between surface and groundwaters has recently become a vital component of many OWRB hydrologic investigations. To develop realistic management options for our water supplies, we must understand this interaction and how development of one resource ultimately impacts the other. 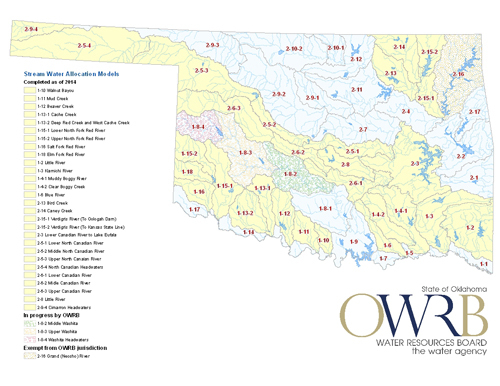 The OWRB has developed a new support analysis tool that will facilitate adjudication and effective management of water rights in Oklahoma. Assess water availability and flow reliability at any location in the basin on an annual and seasonal basis. This information assists current permit holders to maximize the productive use of water and make decisions about infrastructure, types of crops, schedules of use, etc. Estimate the amount of unappropriated water in the system, i.e. the amount of water remaining in a stream after taking into account complete satisfaction of all existing water rights valued at their full authorized amounts and conditions. 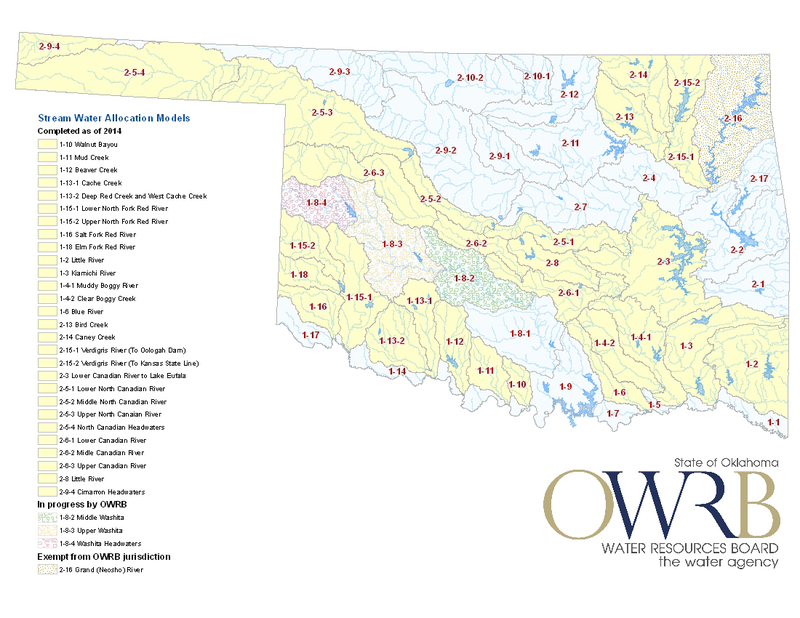 The OWRB uses these estimates to evaluate new water-right applications. Perform drought analyses to determine areas in the basin and water rights that are sensitive to water shortages due to low-flow conditions or interference of water rights. The information is used by the permitting staff to contact users and manage the resource (voluntary or imposed reductions or changes in schedules). Evaluate water policy decisions, including allocation of water, inter/intra basin transfers, interstate stream compacts, climate change, etc. These analyses anticipate the effect of specific management decision and evaluate a range of policy options in advance of their implementation. Allocation models are computer applications that contain data about the river-basin hydrology and active water rights in the system (curently over 60 years of data), capturing the essential statistical characteristics of the hydrologic system and accounting for the probable range of its future hydrology. The models are constructed using a network-flow algorithm in Microsoft Excel® called the Central Resource Allocation Model (CRAM) which simulates management of the water resources under a priority-based water allocation system. Water is distributed in the system on a monthly basis and demands or "water rights" are supplied based upon a selected management scenario. Results from a simulation include estimates of water availability (before and after appropriation), flow and content at reservoirs, amount and frequency of water shortages, and interference of water rights. The OWRB has developed software applications to effectively display the results from the models through statistics, graphs, tables, and maps that show the detail of the spatial and temporal resolution of the model. The Stream Water Allocation Modeling Program will have completed models for approximately 70% of the State by the end of June 2014. The models will have the capability of assisting more than 2,300 existing water rights and new permit applications in these areas. Progress has been made in the development and implementation of stream water allocation models for stream systems in Oklahoma, which are being used as both a planning and water rights management tool. Allocation models have been developed for the Blue River; Muddy Boggy River and Clear Boggy Creek; Kiamichi River; Little River (state line); Upper Canadian; Deep Red, Cache Creek, and Beaver Creek; and Middle Canadian, Lower Canadian, and Little River (central Oklahoma); Verdigris and Caney Rivers; North Fork, Salt Form, and Elm Fork of the Red River basins. Hydrologic investigations and reports for these basins are also being completed. Stream water allocation models are currently being developed for the Washita River, Mud Creek, and Walnut Bayou River systems.